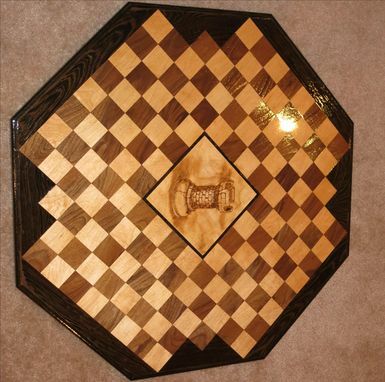 Built for a team of Chess aficionados, this board is for a 4-player variant called Super Chess. Unlike other 4-player boards, this version cuts out the middle and has each army start in a corner to keep the game lively. The board was built with individual walnut and maple squares, attached to a stable backboard and each other. The border is made of precisely matched wenge, which provides a high degree of contrast with the playing surface. 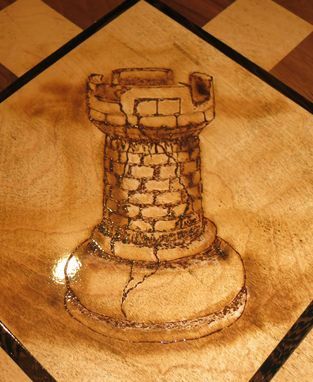 The center includes a hand-burned picture of a stone Rook to finish off the board and add some interest to the top. This model was built from 2x2" squares which became a regular octagon around 32" across. A light stain was applied to the top to add contrast to the wood grain and multiple coats of varnish provide a mirror-like finish.